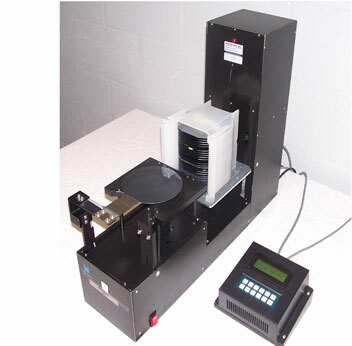 9" x 29" x 20"
The Mactronix PLU will transfer wafers one at a time from a 25 slot cassette to a self-centering chuck for visual and/or bright light inspection. User friendly keypad and four-line LCD screen allows for simple menu driven operation. Transfers are be accomplished through keypad commands and may be programmed for customized sequences. The Technician level menu facilitates periodic cleaning and enables step by step machine diagnostics and testing. Wafer detection is achieved via vacuum sensors to inhibit accidental damage during robotic transfer. Exhaust ported for clean room operation; 5 CFM max (non-process). Mactronix standard anti-corrosion package includes black hard anodizing of all aluminum parts.